‘Oh for an ugly win’ were the words on many a Scotland fan’s lips a week past Saturday following the agonising loss to Australia – and seven days later the rugby gods obliged. Scotland ground out a three-point win over Argentina at BT Murrayfield on Saturday evening with the last kick of the game from Greig Laidlaw and, consequently, moved into the top eight of the world rankings. For a side who have so often contrived to lose games in which they have played well, it could mark an important step forward. The game looked to be heading for an unsatisfactory draw when the Scots passed up three chances to win the Test in the closing ten minutes. 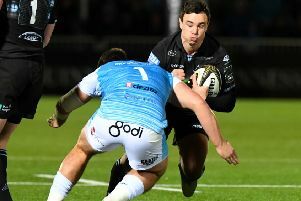 Stand-off Finn Russell squandered two drop goal opportunities – one missed and the other charged down – while skipper Greig Laidlaw struck the post with a penalty. But, with the clock red, Kiwi referee Ben O’Keefe penalised substitute Juan Leguizamon for a no-arms tackle and this time Laidlaw accepted the gift to nail the penalty. Scotland coach Vern Cotter had headed for a comfort break after what he described as “a long 80 minutes” but the good news was relayed to him via the radio mic. “There was a quiet determination within the group to do better than last week and I was so pleased for them because they got their rewards at the end,” said the coach. “It was a real tough arm wrestle but they never gave up. The forwards got it together and throughout I thought we adapted well. “There are always ebbs and flows in games but I thought we came back at them every time. We knew if we kept at them they would give us the ball and we did. Cotter was the first to admit that the match was a “dour” affair in contrast to the often thrilling rugby on display the previous week but the delight with a far more pleasing outcome was evident. Laidlaw edged the first-half kicking contest with Nicolas Sanchez to make it 6-3 to the hosts at the break. But the Pumas started the second period stronger and looked to be taking an ominous grip on proceedings when Sanchez levelled and Matias Orlando collected Juan Martin Hernandez’s sumptuous cross-field kick for the opening try. But centre Huw Jones added to his growing currency as he followed up last weekend’s two-try show with a creator’s role as he broke the line to put wing Sean Maitland in the right-hand corner. The tense arm wrestle continued with another couple of penalties before the dramatic denouement played out. Cotter, pictured, said that he was particularly pleased with how Scotland hit back straight away to cancel out the Pumas’ try but added: “We squandered opportunities and it wasn’t perfect. The boys are not totally happy with how they played. Following the events of the Australia game the Scots could easily have succumbed to a “here we go again” mentality as the clocked ticked down but they showed admirable spirit to keep banging at the door. “I thought the boys showed tremendous belief,” added Cotter. “Finn has missed two drop goals, Greig has missed that penalty but they just kept believing. “That’s a major shift. It’s so important because they kept looking for a way to win and they finally found it. We got some crucial turnovers. “We were in trouble at scrum time but they adapted and the last three scrums were magnificent. “We did a lot of really good things. They are working hard for each other and finding ways to fix it as the game goes on. “The boys showed composure when they had to. The bench brought us a lot when they came on. We finished the game the stronger and we deserved to win. “It was a battle. It was tough and we knew it wasn’t going to be an open game. Laidlaw was able to smile after the game about another disagreement with the woodwork. “That right-hand post doesn’t like me. It was the same one I hit against Australia last weekend,” said the skipper. “The boys were giving me a bit of stick for taking two penalties to win it. But I was happy to see the second one sail between the posts but it was credit to the whole team. “The message after they scored their try was not to panic. We hit straight back and scored our own and that was massive. “We are delighted as we are still annoyed with the Australia game. We knew the game would be won by a penalty here and there. Our forwards beat them up at the end and earned us that penalty. “It was hugely pleasing as it’s great to see there was no panic and for the players to implement what we wanted to do was huge. Cotter is now looking forward to finishing the series on a positive note this Saturday when the Georgians visit Rugby Park in Kilmarnock. A win over the fast-improving east Europeans would see the Scots end the year with a 60 per cent success rate for 2016. However, the underdogs will travel on a high after taking a notable scalp at the weekend in Tbilisi. “Georgia beat Samoa [20-16] and, make no mistake, next week will be a really tough match,” said Cotter. “I know their coach [New Zealander Milton Haig] really well. We have so much respect for Georgia and we know this is a really important game. “They will want to come and make a mark with regards to Six Nations inclusion. “We watched the Samoa match so we’re under no illusions as to what to expect. “Their coach has done a heck of a job. Rugby is the number one sport in Georgia.